The open road always offers its fair share of the unexpected. The first week of the 2011 Transitions/VSP Success is in Sight tour started off with more adventure and adversity than we could have ever imagined. There are more than 50 stops planned, spanning six months and 44 states, but all of that was at risk after a stuck clutch on Day 2. While driving to Moorhead, MS, an angry rumble came from under the hood. The rev-roar worsened as we slowed. Hill-Kelly Chrysler in Pensacola confirmed our worst fears – oil entered the transmission and caused a fatal clog. Bess would have to spend a week in the shop while the transmission was replaced. The cost of repairs totaled a quarter of the overall operating budget for the tour. The cost, if not recovered through sponsorship or donations, threatens to keep Bess the Book Bus from visiting 5,000 children and keep 20,000 books out of under served communities. However disheartening this news was, there was only one option- move on. 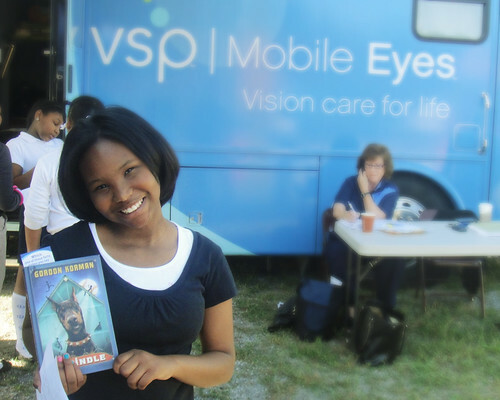 We took this opportunity to divert to Tuscaloosa, AL with Eyenstein, Transitions/VSP’s mobile eye clinic, and address an immediate need in the wake of devastating tornadoes. A string of phone calls and last minute e-mails, all stemming from a Facebook posting from author Sharon Creech, sent us packing to help out with Books for Bama. We loaded up the rental Dodge Caravan and set forth for Tuscaloosa. Five days had passed since the tornadoes tore across the city and the damages were still being assessed. Empty classrooms at Alberta and Holt elementary schools were ripped apart by winds exceeding 130 mph. Bess the Minivan rolled up on the first day of classes for the displaced students. Students and teachers displayed incredible courage and carried on in a very difficult time. Each of the students participated in a raucous story time and received a new book to take home. Each school also received contributions to their classroom libraries, which were lost in the storms. Bess was also able to work alongside Eyenstein at the Red Cross shelter. The Belk Center at Bowers Park was filled to fit 500 displaced children and families. Its parking lot was packed with people trying to help. Mobile shower units, medical examiners and even a phone station stood by and showed their support. 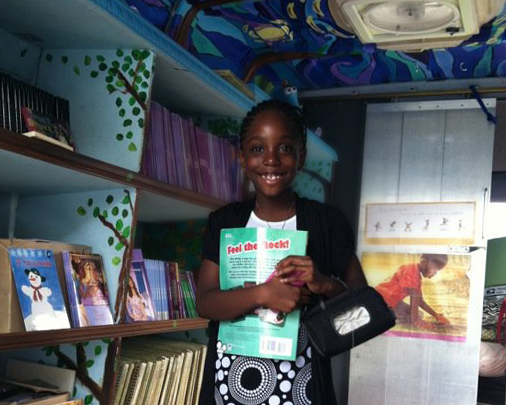 After two days of visits to schools and shelters, Bess the Book Bus distributed more than 1,700 books. The five hour drive home was spent in a humble silence. We were awed by the strength of a city, state and country that banded together to help their neighbors. Upon our return to Pensacola, we were happy to find that Bess was ready to go two days ahead of schedule. This allowed us to keep our promises to some amazing students in the Mississippi Delta. Plans for this event were first made in September 2010, after a teacher at Moorhead Middle School saw Bess on CNN. Chloe Kannan, a first-year Teach for America teacher, explained the difficulties students face. The city of Moorhead is small, spanning less than four square miles, and close to a third of its population lives below the poverty line. 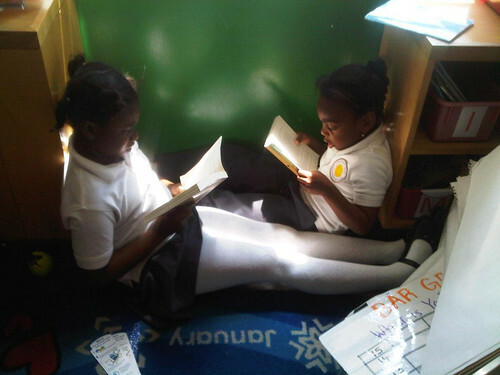 Literacy rates are low in the Delta, but Mrs. Kannan has been fostering the love for reading in her students. At Bess’s request, Townsend Press sent support to the school in December, a holiday surprise of more than 300 new Bluford series books. We also made a promise to visit during our 2011 Success is in Sight tour. We are so glad we did. The reception from the students and faculty was one of disbelief and true appreciation. All 150 made their way on to the bus and picked books from some of their favorite authors, including Ellen Hopkins, Paul Langan and Dan Gutman. Book deliveries were also made to Rosser Elementary and Greenville Middle School. We have completed only the first of many planned stops and already reached more than a 1,000 students. The rest of the nation is waiting to be explored, and are students waiting to have their minds opened. Follow along the adventure with daily updates on Facebook and Twitter. 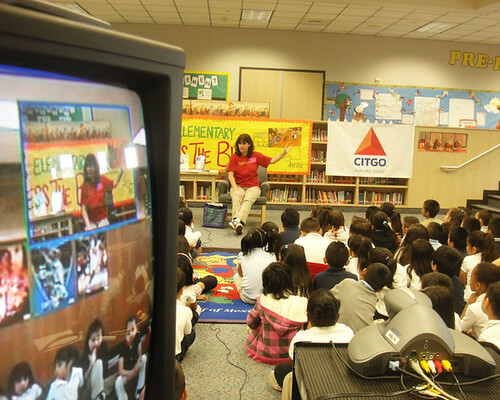 Next stop: Corpus Christi with our partners at Citgo!